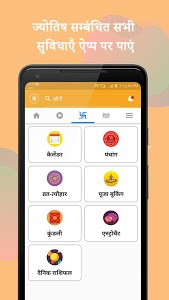 mymandir app is now available in Gujarati (ગુજરાતી), Bengali (বাঙ্গালী), Marathi (मराठी), Kannada (ಕನ್ನಡ)Oriya (ଓଡ଼ିଆ), Telugu (తెలుగు), Malyalam (മലയാളം) and Tamil (தமிழ்), apart from Hindi (हिंदी). mymandir (my mandir) is a celebration of hindu culture and religion. It’s a community of hindus across the world sharing and discovering their rich diversity through photos, videos and stories. You can get Aarti, Bhajan, Mantras, Shlokas, religious programs information, Stotra, daily-darshan from different temples across India. 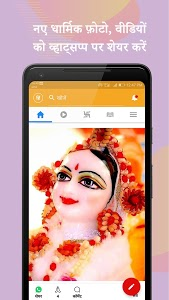 Get new devotional photos, videos, stories and information of your favorite bhagwan (God) every day. Create and join communities of your nearby temples. Ganesh Chaturthi, Krishna Janmashtami, Navaratri, Diwali, Guru Purnima), rituals and practices from different parts of India. Create your devotional profile and start posting your religious thoughts, photos and videos and build your following. 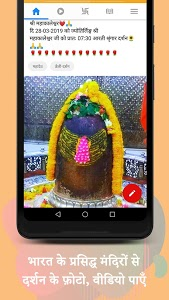 Search nearby temples and can use the map provided in the app to reach there. Make wallpaper of any dharmik photo you see in the app. Get 10,000+ videos of Bhajan, Aarti, daily-darshan, pravachan etc. Save your favourite photos and videos and access them even when offline. 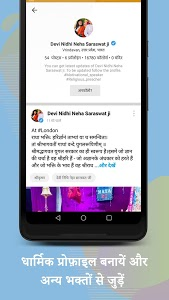 Priests and temple committee members can create an official group to share information about events, pujas and other activities at their temples with all the devotees. 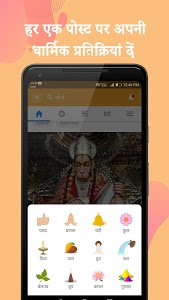 Daily Darshan: Get free photos and videos of temples like Ujjain Mahakaleshwar, Kashi-Vishwanath Temple, Golden Temple, mahakal, Tirupati Balaji, Vaishno Devi, Amarnath, Kedarnath, Somnath, Siddhivinayak and much more directly on your mobile, which is posted by mymandir app’s users. 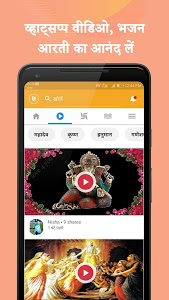 Bhajan: Get a huge collection of Hindi Bhajan like Krishna Bhajan, Shiva Bhajan, Durga Bhajan, Sai Bhajan, Ganesh Bhajan and many folks deities bhajans as well. Chalisa, shloka & stotra: Get Hanuman Chalisa, Bajrang baan, Shiva Tandav Stotra, Krishna Gayatri Mantra, Madhurashtakam, mahakaal Mantra, Vishnu Mantra, Durga Chalisa, Durga Mantra etc. in the form of photos, videos and texts. Religious Knowledge: There is a very rich collection of devotional stories ( dharmik Katha and pauranik katha). Fast & Festivals Info: Get all info related to Indian fast and festivals like Pradosh Vrat, Ekadashi Vrat, Ganesh Chaturthi, Janmashtami, Mahashivaratri and much more. 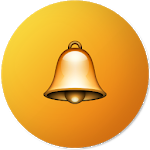 Temple Darshan: Daily information related to many Hindu, Jain, Buddhist and other temples posted by the users. Dharmik Selfie: Share your dharmik selfie with your friends on whatsapp, kimbho, facebook, sharechat and on other networks. We hope you join us in our goal to connect hindu devotees and temples from all over the world. 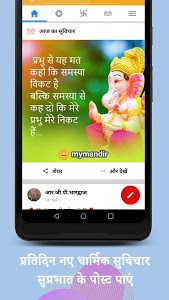 We have made significant improvements in mymandir app. Please share your feedback with us. We're at [email protected] Don't forget to rate us on playstore. Similar to "mymandir - Rashifal, Hindu Panchang, Bhakti Videos"